Mario will get his fluffiest power-up ever in Super Mario Galaxy 2. After becoming a bee, a flying racoon, and a caped superhero, Mario is finally ready to take a trip through the clouds as a cloud. As uncovered by Official Nintendo Magazine UK, Mario's latest power-up revealed for Super Mario Galaxy 2 is the ultra fluffy Cloud Mario. 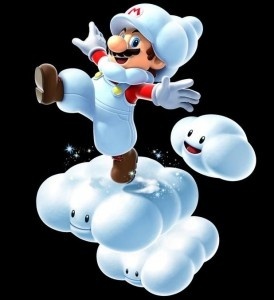 Currently, details are sparse on Mario's new suit made from evaporated water droplets typically suspended in the atmosphere until they amass into precipitation. I'm hoping that it'll be cumulus, but you never know, it could be cirrus or altostratus. On another note, why are clouds so happy in the Mario games? Though only rumored at this point, according to NeoGAF players will point at the screen with the Wii Remote to draw clouds while Mario is in cloud form. Mario will then jump from cloud to smiling cloud. Nintendo just keeps coming up with ways to make Mario cuter. For the sake of all that is holy, Cloud Mario even wears a necklace of clouds and a neat cloud hat. I would make out with him if I could.